As someone who has read about and dreamt about beating the existing New York to Los Angeles records for most of my life the history has always been hugely interesting to me. I know that for many other fans of this notorious challenge our participation is merely the latest chapter in an extremely compelling volume of automotive history. For many of my friends and family, that history may not be as clear so I thought I would toss together a few notes to fill in the gaps. The Cannonball Baker Sea to Shining Sea Memorial Trophy Dash, colloquially known as the Cannonball Run, was run in the 1970’s by Brock Yates from Car & Driver Magazine. This was run either from NY to LA or CT to Newport Beach and the fastest time from it was 32 hours 54 minutes by Dave Heinz & Dave Yarborough in a Jaguar XJS. Yates chronicled the history of Cannonball in his book which was released in the early 2000’s. It is a great read. I spoke to him in 2004 as a senior in high school and told him that one day I was going to break the existing records. The Red Ball Garage in Manhattan, which was the parking garage used by Car & Driver Magazine was the commonly accepted starting point and the Portofino Inn in Redondo Beach, California was the most traditional finish line. From 1981 to 1983 another event was run called the US Express. The fastest time from that event was David Diem and Doug Turner in a Ferrari 308. They completed the drive in 32 hours 7 minutes. That record stood until 2006. In October of 2006 Alex Roy did the drive from the New York Classic Car Club to the Santa Monica pier in a 2000 BMW M5. This drive, along with the history of the US Express events is documented in the film “32 Hours 7 Minutes” that was released in 2013. Alex’s co-driver was Dave Maher. Roy did not tell anyone about the record for one year at which point he also released a book called “The Driver.” I have read it several times and highly recommend it. I have known Alex since before he set the record and spoken with him dozens of times over the years. He is an excellent sportsman, competitor, and petrol-head. He has been helpful, supportive, and gracious throughout our relationship and my success with this would not have been possible without him. Alex’s time was 31 hours 4 minutes. In May of 2007 Richard Rawlings of Gas Monkey Garage/Fast & Loud and his friend Dennis Collins drove a Ferrari 550 Maranello from the Red Ball Garage to the Portofino in 31 hours 59 minutes. Rawlings and Roy have both claimed the record from 2007 until our drive with Rawlings claiming a “Cannonball Record” and Roy claiming a “Transcontinental Record.” I have spoken to Rawlings on several occasions since our drive and he has been great. Nice guy, real car enthusiast, and a lot of fun to speak with. On October 12, 2013 Greg Ledet and co-driver Mark H. did the drive from Trump SoHo Hotel to the Santa Monica Pier in 31 hours 17 minutes. They drove a BMW 335. This was one week before our drive and the Columbus Day Weekend Anniversary of the drive by Alex Roy/Dave Maher. 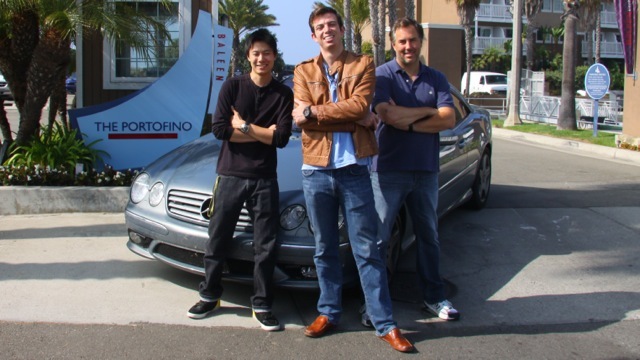 On October 19-20, 2013, along with co-driver Dave Black and support passenger Dan Huang, I drove my 2004 Mercedes CL55 AMG from the Red Ball to the Portofino in 28 hours 50 minutes. This was discussed and documented on Jalopnik, The Today Show, CNN, USA Today, Men’s Journal, Huffington Post, The Daily Mail, NY Post, NBC, ABC, FOX, AutoBlog, my alma mater Georgia Tech, our local newspaper the AJC, as well as thousands of other news sources. We had a perfect combination of good weather, no traffic, no issues with the car, no interference with police, and an amazing team. The unbelievable margin between the existing records and our time would never have been possible without the stories, advice, and examples from the people who came before us which helped us control these uncontrollable variables as much as is possible. I doubt I could accomplish it in at the same pace with 10 more tries. It was a dream outcome to a lifelong goal. Thanks again to everyone who was a part of it.